In early spring 2007 Alberto Cavallini and myself, began a series of experiments, We knew from our knowledge of ceramics, that glass shared many of the same elements as clay, and if it were possible to build pottery kilns from clay, as we had been doing, why not glass bottles. We finally came up with our first prototype, The Chianti bottle kiln, ( You tube) is proof of the first bottle kiln firing. The 2nd kiln we built here at my house, full size, we decided to invite friends, and members of our association Arte Della Ceramica. Of which one member was Karen Putsch-grassi. During the firing, she filmed, and took photos, and wrote notes. Fine, I have never had problems with people doing this during our experiments. The firing was a great success, and Alberto and I performed our first public event, in the piazza of the Chianti town of Greve. Some time later maybe six months, Karen had built her own bottle kiln, on the wine farm of her husband. Fine, no problem with that, in fact, it was a great compliment to Alberto and I. Next thing I see, is an article in the British ceramic journal, Ceramic review. Titled Chianti kiln Karen Putsch-Grassi. She had single handily, decided to own the bottle kiln. She was then obviously invited to various events on the back of this false article. I wrote a strong letter to the editor of Ceramic review, who then did his own research, and found grave errors. They publicized a apology. I then took the case up with the Arte Della Ceramica, then with 60 members. A meeting was called, and the trial began during an afternoon.. The outcome was she was unanimously expelled from the association. And she went on to perform her kiln in ceramic events. She has now just launched a new website, and of course the bottle kiln in pole position. In such a small family world of potters, that we are, I have never in my years of world travel, as a potter come across such a devious cheating piece of scum. And I hope one day she pays a price for her actions. 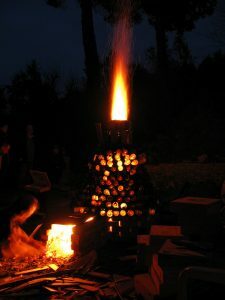 I first witnessed the building of a bottle kiln in April of 2007 at Janet Mansfield's ClayEdge conference in Australia. Ever since that time I have been hoping to build one where I work in Canada. I have just gotten permission to build it in the city of Burnaby, B.C. we will be firing our bottle kiln in December and will document it and probably post photos. I certainly would not call it a chianti kiln. Hi linda, in fact in my opinion nobody has to get permission to build one from the original builder. First of all because Terry was not the first one to build this kiln. And also even if he had been the original builder it's only an idea on how to build a kiln with bottles, it's not patented. Everyone can take the idea, modify it and make it better or slightly different, as the potter which is discussed above did . Nobody has to ask permission to nobody. I would first like to say, that if you read more carefully my thoughts on .......... you would read very clearly that my problem is not who builds my CHIANTI KILN. I have always been very free with my designs and ideas over many years It's the fact that this person, who was once a friend of mine, and invited to see my new development in my house, some months later wrote an article in the british ceramic journal The ceramic review. and the article was called The Chianti kiln. Now I don't know mr goody shoes Henry golding, if in your life you have ever experimented and come up with new ideas, but if you had, I would like to know how you would feel. And secondly Mr Henry golding. could you tell me if you know that my kiln is not the first, please give me information on who ?.